Genre : Comédie poétique / Références : Clown / Bouffon / Cinéma muet / Théâtre burlesque / Accessoires : Pied de micro et chaise / Personnage : LUI, homme d’âge moyen / Public : Absolument tout le monde. Its a show that came to life during the worst year of my life and for that reason I said to myself, it needs to make people laugh. Nothing more. No complicated philosophy, no existential questions, no hassle, just laughing. During my travels around the world, whether it be Argentina, the Czech Republic, Panama, South Korea, in Africa on the coast of the Atlantic or the Indian ocean, I could see in my spectators’ eyes the cathartic/purifying need to laugh. That gave rise to a simple, personal desire : “create a show that can make anybody and everybody laugh”…the subject matter that life’s journey gave me was interesting : create a character who always finds himself in the wrong place/out of place. That is, me, here and now. It’s not easy to laugh about oneself ! Do we laugh about the same things ? and laughter, is it the same all over the world ? This is where Eddy came in, with his perspective and expert opinion. Eddy, or Edouard Dedessus Le Moutier is a gentleman in its truest sense. he’s a man of the circus, an acrobat, a clown. He was born in the circus and has worked there all hs life. His brothers and he, under the name “the beavers/les castors” are one of the noble families of international circus’, from father to son. A project that boasts about being “international” needs an international vision. Eddy has that vision, shaped by a long career and experience, in which he saw the birth of tomorrow’s circus’s, some crazy clowns, and shows. 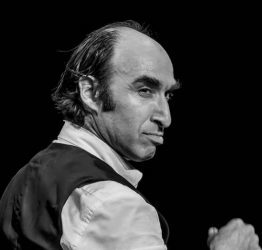 By means of a very physical approach, « out of place » highlights the adventures of this ordinary man, thrown into the ‘extraordinary’ of the theatre. An ordinary body within the mechanics of the theatre. And this body shakes, stirs, struggles, and reacts. This body acts in the spotlight of the contradictions that surround it. It’s adventures are mirror images of our own tribulations in seeking the “right place” in the theatre of our own lives. That’s when they become an endless source of inspiration. One question remains: “Does anyone really know their true place?”. Those capable of answering are invited on stage !